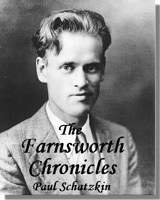 Hollywood may finally be taking notice of Philo T. Farnsworth. As some of you may recall, when Aaron Sorkin stepped down as executive producer of NBC's The West Wing back in the spring of 2004, he announced that his next project would be a feature film, The Farnsworth Invention. Sorkin's interest in the Farnsworth story reaches back at least a decade. 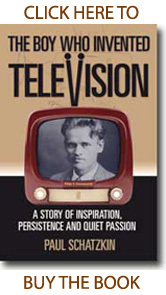 During the 1990s, Sorkin considered writing a screenplay for Castle Rock Pictures; he was introduced to the material by the company that owns film rights to Pem Farnsworth's book, Distant Vision. 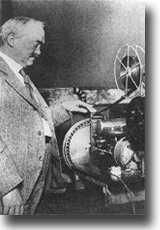 He even spent some research time with Pem at her home in Fort Wayne, Indiana while working on that project. The Castle Rock project fell through, but Sorkin's interest in the story never lapsed. In 2002, during the commercial break right after Pem was introduced to the audience at the Emmy Awards, Sorkin approached Pem and said "we're not done with this story yet...." Two years later, his film was announced (though there was no participation discussed for Mrs. Farnsworth or the estate....). Sorkin's film project has faltered, but his interest in the story continues unabated. 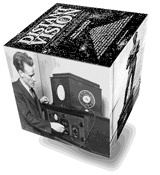 The Farnsworth Invention has now been adapted as a stage play which will be performed at the La Jolla Playhouse near San Diego as a "page to stage workshop production" from February 20 to March 25, 2007. This week, the cast for the play was announced and rehearsals have commenced. Jimmi Simpson will play Philo T. Farnsworth; Stephen Lang will portray David Sarnoff, and Alexandra Wilson will play Pem Farnsworth. This stage-to-screen process is familiar to Aaron Sorkin. One of his most notable films, A Few Good Men (with Jack Nicholson, Tom Cruise, and Demi Moore) began the same way, i.e. starting out as a stage production in order to develop the material before converting it into a feature film. There is no doubt that a similar evolution is contemplated here, inasmuch as no less a personage than Stephen Spielberg has signed on as an executive producer of the La Jolla Playhouse production -- Spielberg's very first foray into stagecraft after an illustrious career as a film and television producer and director. 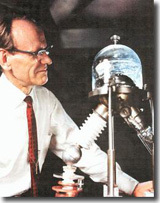 That can only bode well for the future of The Farnsworth Invention. Kent Farnsworth has been following all this very closely for philotfarnsworth.com Visit his website to see photos of the cast juxtaposed with their real-life counterparts, or to purchase a copy of Pem's book. I am also going to be retooling my own "farnovision" site in the days and weeks ahead using a Typepad "blog" format so that it will be much easier to keep pertinent information front and center as this saga continues to unfold. That format has worked very well for my Townsend Brown website, so I'm going to replicate that format for Farnovision as well as my other websites.